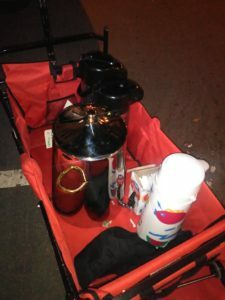 On Saturday night with temperature dropping steadily, we at Lauren’s house geared up with hot water canisters and coffee urns and headed out to San Francisco. Our goal for the night was to spread some warmth and love along with a bowl of delicious noodles.Our first stop was near the Salvation Army where a group of people were waiting to get into the shelter. While they waited meals were served by our caring and smiling youth, who also took time to sit and talk to them. After that we targeted under the 101 overpass, draped in the shadows of the underpass we saw many people laid in rocks with just a blanket to cover. One of the guys asked us for prayer as we handed out a cup of noodles. At the end of the night we passed out 48 cups of noodles and had to call it a night since the water was getting too cold to use. We at, Lauren’s House believe that we are not only feeding the hungry physically but also spreading love and warmth hence feeding them emotionally.